I’m in the middle of my craziest summer. We sold a house, bought a house, and moved, and then of course decided the next week would be a good time to go on a week-long trip to our nation’s capital. That was also the week I started my final three courses for my MLIS degree, and now this week is my comps week, when I write 4 big essay questions so I can graduate. DH had another load to grab from our old homestead (his shop has taken at least 6 loads with a big trailer plus a full pickup) and this time brought the farm dogs. We are out in the country still, but not in the boonies anymore – we have neighbors across the street. So the dogs are forced inside by mean-old-me, thus, I’m up blogging at 12:30 a.m. Oh and did I mention I start my new job in 15 days? I did find time to go to a “discuss books group” – not a book discussion group – which was lots of fun. We all talked about some of the books we’ve been reading lately. One group member had a very long list of books that she’s read since last month. Very motivational! I thought of a few books to mention – The Caretaker of Lorne Field, e.g. – but I am going to write the ones down and do better. Once I get done with my classes in July, I’ll definitely have more time to read for pleasure. Even with my new job – but of course I need to model reading, don’t I? 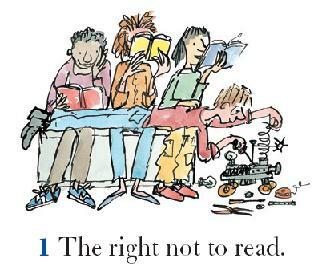 Daniel Pennac wrote a book – and the great Quentin Blake illustrated – called The Rights of the Reader. In library school, we hear a lot about intellectual freedom, the right to read, etc. 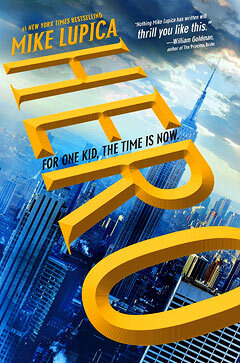 But then in the school library, it’s all about Accelerated Reader. The two aren’t necessarily at odds, but often they are. When I substitute teach, I try to make my way to the school library, and often I’ll hear teachers (or even librarians) say something like, “Oh, you can’t check this out, it’s out of your AR level.” That’s so sad to me. I know AR can be a great program. In my children’s previous school, there was an AR auction at the end of the year, with cool prizes, not the chintzy pencils or bouncy balls, but a ride in a limo, a beret bought in Paris, even a stereo system. Those kids were excited about AR and everyone got a prize. The problem is, of course, that we’re tethering ourselves to this very expensive program whose very premise ties an extrinsic motivator to what should be an intrinsic one. When we give children a limo ride or money or even a mere pencil, we’re taking away something important: reading for the joy of reading. And yet, I’ve seen kindergarteners go after the Wimpy Kid books when there was no way they could read them. (That’s when the graphic novel section of this bookstore model came in handy – they wanted pictures? Here’s some pictures!) Then when the fourth graders came in, Wimpy Kid was all gone. Students obviously need to read books at their reading level – I suppose that’s when the 5 finger test comes in handy. But download this great poster on the Rights of the Reader. I’d say I especially adhere by Rule 7, the right to read anywhere! The picture below, though, is for Rule 1, the right not to read. Even if that’s not a right I choose to use, it’s my right nonetheless. Do we let children have that right – even occasionally?